The PopLok Inserter system from Eagle Packaging Machinery makes adding an insert to a folding tray a snap. 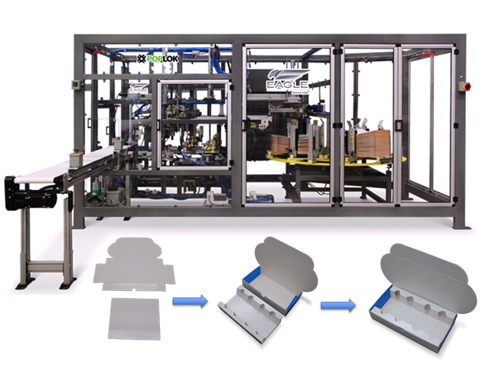 Eagle Packaging Machinery expands their line of tray formers with the PopLok Inserter, a new system that automates the tedious hand-loading process for placing an insert into a fold-and-tuck style tray. The PopLok Inserter conveniently loads an insert blank, squarely forms it, and precisely places it into the tray all in one compact machine. The insert, highly suitable for various electronic pieces and components, serves to ensure that fragile contents are separated and neatly secured for shipping. The PopLok Inserter delicately handles corrugate and chipboard material to consistently produce a quality finished product. The careful handling process certifies that high gloss graphic aesthetics are not marred in any way for high-standard retail requirements. Because the PopLok Inserter does not use a mandrel, operators can also perform rapid changeovers without tooling. Other differentiating features of the PopLok Inserter are dependable 24/7 operation, world class components like SMC and Tolomatic cylinders, Omron or Allen-Bradley PLC (programmable logic controller), and a seven-inch color touchscreen HMI (human-machine interface) allowing for user-friendly operation. Dependability and simplicity along with many other value-added benefits make the PopLok Inserter the ideal tray forming solution. For more information on the Opa-Locka, Florida-based company, visit www.eaglepm.com.